by Luis de Carlos Bertrán. The Golden Age of Spain was safeguarded by men of iron. Some, like the third Duke of Alba or Gonzalo Fernandez de Cordoba are known, if at all, by military historians. Others like Cortes and Pizarro are reduced to the role of villains in contemporary debates on colonialism and indigenous rights. Others, like the invincible admiral Alvaro de Bazan are hardly remembered by anyone. 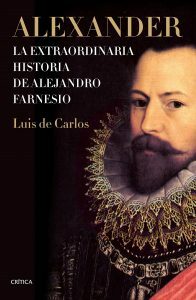 Only slightly better known than de Bazan is Alessandro Farnese, Duke of Parma (1545–1592), the subject of an excellent new biography by Spanish lawyer and business consultant Luis de Carlos. Alexander: La Extraordinaria Historia de Alejandro Farnesio is a robust, meticulously researched work of scholarship that effectively and enjoyably tells the story of the Italian nobleman, general, and administrator involved in some of the great European events of the sixteenth century. Calling Farnese “Italian” is only part of the story. He was indeed a scion of that ancient Italian family that had produced so many churchmen and condotierri. His father Ottavio was the grandson of Pope Paul III (who was also named Alessandro Farnese and as a young cleric fathered five children). His mother was the illegitimate daughter of the King of Spain and Habsburg Holy Roman Emperor Charles V and a Flemish servant girl, Johanna Maria van der Gheynst. De Carlos relates how when the young Farnese’s uncle King Philip II of Spain wanted to find a royal bride for the young man, his cousin, Austrian Emperor Maximilian II, refused to provide a Habsburg mate because there was too much illegitimacy in Alessandro’s family tree. King Philip eventually found a Portuguese princess for the young man. The complexity of the struggle for power by the European elite is well illustrated by the fact that Alessandro’s father had to fight to maintain his hold on Parma against both the same papacy and Habsburgs with whom he had such connections. The family had fought on both sides during the infamous sack of Rome in 1527. When Alessandro was packed off at the age of eleven to be educated at the court of his royal uncle in Spain, he was part ward and part hostage. He was instructed along with Philip’s ill-fated eldest son, Don Carlos, and the King’s half-brother, Don Juan of Austria, he of Lepanto. A strenuous training in Renaissance humanism, Catholicism, and military skills suited Farnese well. He was particularly interested in fencing and fortifications, writing a book on the latter and using his sword more than once in defending himself from late-night cutpurses and hedge robbers. When Don Juan triumphed at Lepanto in 1571, Farnese was there, fighting on a Genoese ship. But he wanted much more. In 1577, Farnese sent his uncle a letter asking to be of service. He sent a similar one to his wife’s cousin, King Sebastian of Portugal. Had not Spain called before Portugal, Farnese could well have fallen at the disastrous Portuguese defeat at Alcacer Quibir in Morocco in 1578. There were very few survivors. Action came for Farnese in a summons to be the deputy to his uncle Don Juan of Austria, sent to be military commander and Governor of the Spanish Netherlands (comprising today’s Netherlands, Belgium, Luxembourg, and part of Northern France). The second decade of what was called the “Eighty Years War” (1568–1648) was beginning, a disastrous and draining conflict for Habsburg Spain. Fernando Giron, a veteran of the famed Spanish infantry regiments, the tercios, would much later describe the Flanders conflict as “the longest, costliest, bloodiest, and most unending” of all the wars in the world. The horrors of this war—massacres, religious violence, mutinies—were precursors to the Thirty Years War of the next century with which it would merge. Don Juan was barely holding on. Most of the country was in the hands of rebels, Protestants and Catholics, who were doggedly led by Prince William the Silent, once a favorite of Charles V and now a Calvinist feverishly working to end Spanish rule. While the struggle was about much more than religion, religion was an important factor. King Philip II, a Christian humanist who was dubbed “Philip the Prudent,” had said that he would rather give up all his states and die many times than be a lord ruling heretics. Alessandro arrived at the right moment to aid a desperate Don Juan. A Spanish army paid for with newly arrived American silver crushed the main rebel force, reinforced by English money and Scottish infantry, at Gembloux. A bold cavalry charge led by Farnese panicked the entire rebel army, killing thousands. Spanish losses were minimal. The conflict in Flanders, that shipwreck of so many Spanish illusions, made Farnese. Or rather, it was the broken field on which his many talents became apparent. Months after Gembloux, he took over temporarily from the dying Don Juan, and never looked back. In addition to being a bold and effective military commander, the thirty-three-year-old revealed unexpected gifts in diplomacy and intrigue. He neutralized outside forces coming from France and Germany to aid the separatists and appeased his fractious, often mutinous regiments whose pay was months and years in arrears. His military success, often in siege warfare, was coupled with a policy of fracturing the rebel alliance and reconciling the Catholic part of the provinces. Farnese also played an able game with Madrid. He outmaneuvered his uncle King Philip II when he sought to name separate military and civil heads (keeping Farnese as commander and naming his mother as Governor General). He had made himself too valuable to dismiss. Farnese’s brilliant leadership was capped by the taking of the seaport and commercial center of Antwerp, one of the richest cities in Northern Europe, in 1585. When he had assumed command, Spain only controlled three of the region’s seventeen provinces. Now they controlled nine, disputed five, and only three were fully in the hands of Dutch rebels. It was a remarkable reversal. De Carlos’s fulsome description of Farnese’s fourteen-years’ sojourn in Flanders, of his many military and diplomatic triumphs, also demonstrates a key point of statecraft. Great men can soften bad policies but may only delay the fate found in imperial overreach. In the end, Philip II “the Prudent,” was anything but. The failure of the Armada encouraged Spain’s enemies everywhere, from the high seas to the Dutch rebels. De Carlos notes that there is a different Farnese before and after that event. Having become Duke of Parma after the death of his father, he will never see Italy again. He is increasingly ill, probably from kidney disease. He has enemies at court, whispering in the ears of his uncle. He is usually dominant in the field, often victorious, respected and feared, but the challenges multiply and the scene is darker. Instead of letting him focus on finishing off the Dutch, Philip II sends Farnese to save Paris from the Protestant Henry of Navarre. He saves Paris. He saves Rouen. But Henry triumphs in the end by nominally, and famously, converting to Catholicism and becoming King of France. The time, money and blood poured into France and other unprofitable sideshows ensured the survival of the Dutch and the dissipation of Spain’s power. The strategic vision of the Duke of Parma saw this. But his royal master and uncle didn’t. De Carlos’s biography brings alive not just one of the great captains of the age but the age itself. One hopes that it will be published someday in English. Richly detailed and compellingly written, it is an eminently readable view of a Spanish empire in full flower and conflict, through the life of one of its brightest paladins.